Located East of Hwy 52 in Northeast Calmar. 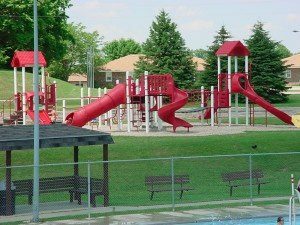 This park has been a part of Calmar for many years and is supported by the area Lion's Club and the City of Calmar. New playground equipment was installed in 2001 and in the spring of 2003 a new softball/baseball facility was constructed by community volunteers with financial help from area organizations. The Ball field facility was dedicated at the City Wide Picnic on August 7, 2003. The South Winneshiek School district donated their old football field lights to the City and in the spring of 2011 the lights became operational. The Calmar little league teams now play the majority of their games at night at least partially "under the lights". This enabled working parents to attend the games. There are two shelters, electricity, water, modern restrooms and playground equipment at this park. Located on Hwy 24 West adjoining the Calmar Swimming Pool. 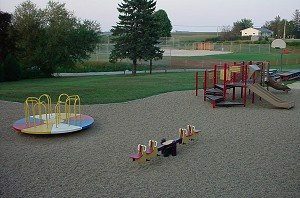 The playground facilities in this new park were installed in 2001 by the Calmar Area Jaycees group in conjunction with a grant received to update pool and park facilities. In late 2001 and the spring of 2002 they completed a shelter facility with electric, water and indoor restroom facilities at this park.